Prominent & Leading Manufacturer from New Delhi, we offer wine cane basket and wooden cane basket. 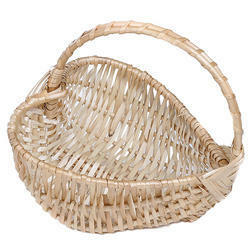 We offer wide range of Hamper Baskets in Bamboo. Our clients can avail from us amazing collection of Round Handle baskets Set. The expert designers make use of high-quality broker cloth, lace and stones specially in manufacturing these products.